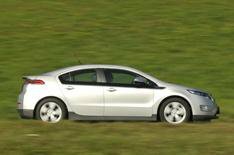 Small family cars: Chevrolet - Hyundai | What Car? The Volt is the sister car to the Vauxhall Ampera. It will offer the same range-extender hybrid technology and some astonishing (and probably optimistic) headline figures of a claimed 235mpg and just 27g/km of CO2 emissions for 450 less. Its still not cheap to buy, at more than 28k, but the Volt is impressive on the road, with smooth acceleration, excellent refinement and decent practicality. Some frustrations remain, such as poor rear visibility, but its a terrific, believable way into some cutting-edge technology. Honda has chosen evolution rather than revolution for the ninth-generation Civic.It shares its basic platform with the outgoing model, but theres a new body, an updated chassis and a range of new engines. The styling follows the theme of the outgoing car, but theres a bolder front end and an emphasis on cutting aerodynamic drag to boost efficiency. Initially, therell be a choice of 1.4- or 1.8-litre petrol engines, or a 2.2-litre diesel; all are more powerful and cleaner than the old models. The new Civic is a stable motorway cruiser. It grips strongly and resists body roll well, too. Unfortunately, the steering is overly light and devoid of feel, and an unsettled ride means comfort isnt great. All Civics suffer from a lot of road noise at speed, too. The 2.2 diesel engine is very strong, but noisy; the 1.8 petrol is quieter and usefully flexible. We've driven the 1.6 diesel version, which will be the pick of the range when it goes on sale in late 2012. The Civics dashboard is more conventional and easier to use than the outgoing cars, and interior quality has improved. Rear visibility is better, but still not great. As before, the cabin provides lots of legroom, a clever rear-seat folding mechanism and a huge boot. Front headroom is tight. Even entry-level SE trim includes alloy wheels, climate control and a USB socket. Prices (16,495 to 26,595) are similar to the outgoing Civics. There are no immediate plans for three-door or Type R models. Five years after the Hyundai i30 was launched, theres a second-generation model. In that time, the i30 has established itself as Hyundais best-selling car. The new version looks very different to the outgoing car, with a bolder, sleeker look that owes much to the recently launched i40. The model change also brings an increase in size: the new i30 is longer and wider, and provides 10% more boot space. The interior has been upgraded, too, with soft-feel plastics, plenty of interior storage space and the option of a seven-inch infotainment screen. Value for money was key to the original cars success, and the new one will continue that. The 1.6-litre CRDi diesel will offer CO2 emissions below 100g/km, and therell be a choice of three other engines with a total of six power options on offer. Prices are expected to rise, but standard equipment levels are likely to be very generous.